Kforce offers an established and industry-leading solution to address our clients’ most prevalent concerns with leveraging a third-party vendor channel. To mitigate exposure to risk and fines, employers require the expertise of a partner dedicated to an exceptionally compliant vendor qualification process. Kforce executes an efficient delivery and compliance program to validate candidate and vendor eligibility throughout the full recruiting lifecycle. 1. What internal controls are in place to ensure speed, quality and compliance? Our national network of 60 offices, two national recruiting centers and over 2,000 staffing specialists enables us to identify quality candidates quickly. We leverage one centralized and highly experienced candidate and vendor review advisory board to vet all candidate submissions, authenticate candidates’ work authorization and remove all noncompliant candidates from the hiring process. 2. How well do you know your suppliers? Kforce’s Independent Contractor Qualification process determines whether a vendor is in good standing, holds the required insurance coverage and is compliant with all state and federal regulations. 3. How well you do you know your consultants? 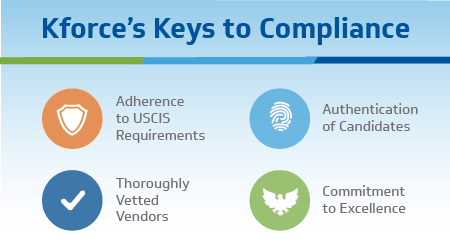 Kforce’s Consultant Work Authorizations ensure candidates’ eligibility to work in the United States as well as verifying adherence to United States Citizenship and Immigration Services (USCIS) standards. 4. What level of commitment do you have from your vendors and their suppliers? Kforce establishes contractual agreements between consultants and vendors, outlining terms and conditions of the partnership, e.g., compensation criteria, project duration, rules of engagement for proprietary information, etc. 5. How often do you audit your vendors and candidates to ensure eligibility? Kforce audits multiple times throughout the process: prior to candidate interview with client, prior to consultant placement, prior to consultant work authorization expiration and as requested by client (scheduled or ad hoc). We proudly partner with top vendors to place highly skilled candidates. Contact us for more information about our vendor client services.